Students in the doctoral audiology program will have the opportunity to be involved in clinical research projects with the department faculty, as well as conduct their own research under the guidance of the faculty. Student research grants are available through BU and National Organizations (AAA, ASHA). Students are encouraged to present their research at State and National meetings. 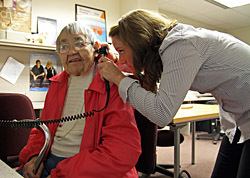 Practicum opportunities are available through BU's on-campus Audiology Clinic in Centennial Hall and contracted services the clinic provides to local public schools, hospitals, private practice and industry. Affiliations are also in place with more than 80 hospitals, clinics, public schools and private practice settings.